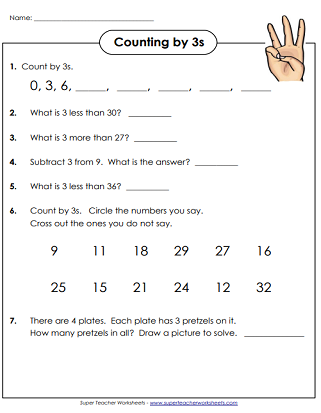 With these worksheets, students will learn to skip count by 3s. Count 3, 6, 9, 12, 15, and so on. The fish, flowers, crayons, and snails are in sets of threes. Count by threes to find the total number. The penguin bellies have numbers on them. Skip count by 3s to fill in the missing numbers. Can you count by 3s? Complete the tables by writing the missing numbers. This printable features three horse illustrations. Helium balloons with numbers on them adorn this page. Fill in the missing numbers when you count by 3s up to 72. 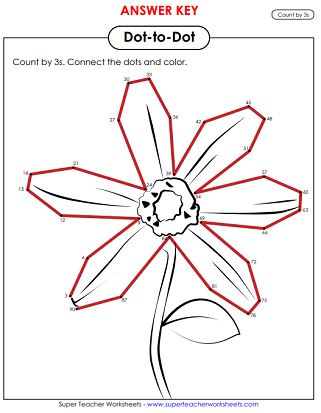 Skip count by 3s and connect the dots to make a picture of a flower. Answer the word problem questions about counting by 3s. Following the circles, count by 3s and write the missing numbers in along the way. Fill in each section of the caterpillar by skip counting by 3s. Count by threes on the hundreds chart. Color every third number. Are you looking for skip counting by 2s, 5s, 10s, or 4s? Check out the full skip count index page. 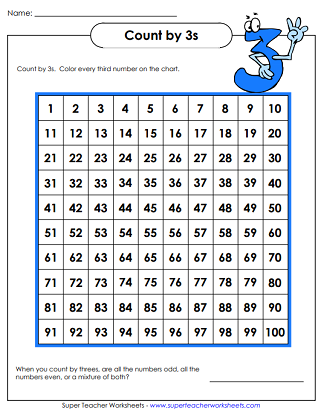 These counting worksheets feature larger numbers with two or three digits. Learn the most basic number recognition and counting skills with these 'counting up to 20' worksheets. Review the differences between even numbers and odd numbers. If you're looking for hundreds charts, 99s charts, or hundreds chart puzzles, this is the page for you.